Well, I did it again. Yes, I won Blog Engage guest blogging contest again. Again? Yeah, I won 1st prize of $250 in Blog Engage Guest Blogging Contest #2, and I have won Blog Engage guest blogging contest #3 with 1st prize of $250. It wasn’t much difficult like last time. But I really enjoyed it. This is my 3rd back to back content winning. Yipiee! Here’s the official post where winners are announced: Blog Engage Guest Blogging Contest #2 Winners! #1 $250 USD Abhi aka (oddblogger) with 10 reasons why I will not accept your guest post? #2 $150 USD Jafar with How To Get Ideas For Your Next Charming Blog Post? #3 $100 USD Kris with Blog Comments Or Social Shares: Which Can Bring Your Blog On Top? Congratulations to Kris, and Jafar! 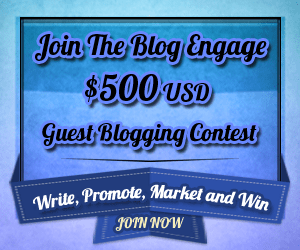 Blog Engage will be up with the next contest of $500 in a few days. Maybe, tomorrow. And at the end of the year, the final contest will be of $1000. So, get ready to participate. I am going to participate again. So, make sure to sign up for Blog Engage (affiliate link, use MINE , why not? ), a one time sign up fee is necessary to join the blogging community. If you want to know why you should sign up for Blog Engage, then you can have a look to my article: Blog Engage- Right place for Blog Promotion and with that you’ll get so many chance to participate and win contests. I have participated again, and REVEALED all my WINNING STRATEGIES. Have a look to my Contest Entry! I am gonna write another amazing post in next contest. I hope you’ll be there to support. Of course I will be there, bro !!! But I too am thinking of participating the next time. I hope all goes well and you see me as your competitor there. WOW! That would be great. We’ll have fun. Thanks for your wishes. You wanna read my secrets? Then show some support for me in the contest and hit all the share buttons and participate in comments. It would be great if you do so. And participate in the giveaway on my blog. Congratulations once again and you deserve it brother. Now it’s high time for you to provide some guidelines to us so that we can also try our luck in such guest blogging contest. You said it absolutely right. Just wait for my next contest entry. That’s great that you are winning again and again. Congrats on your winning bro! Thank you for your wishes m friend! Awesome posts. Congrats to the winners. Wow..That’s gr88..:)) You have won it again. You rock it. Bro you have talented thinking. The topics you choose are catchy and also tends us to look it. I enjoy seeing you article titles which will be different from others/. Dare to Different. Looking forward for your upcoming articles. Thank you for your wishes and congrats to you to for winning the phone. Catchy posts are the reason of my post success. Three times in a row! Wow! That is something. 🙂 CONGRATS! great stuff man , You should start giving credit to everyone who gave helped you in winning hehe. LOL! Yeah. I would have to credit 1000s of friends and readers. Congrats my friend! I’m so proud of you with works, school and blog contests. You are such a great inspiration for blogger I cannot wait to see your next article! If you keep up this you will make so much money from Blog Engage as we host a contest every 45 days now. Thank you very much. You are proud of me, it sounds really good to me. Well, I will submit my article ASAP. And THANKS A LOT for the appreciation. Maybe you should pack up the blog and just make a living of winning contests, you seem to be making a nice steady earner. Adhi, Congrats keep up the excellent job. That’s weird, I thought I had already left a comment here to say Congats. Oh well. Congrats again Abhi. you did a great job on your posts both times, and it shows in your engagement. You got lucky, that’s all….(jk,…jk….) I got pulled away by a client in crisis who needed my attention more than my post, (oky, they also PAID me a lot more than the winning post would have…) otherwise I would have given you a run for your money. I was preparing for my engineering exams. You know, I had TWO exams today. So, the point is I wasn’t much into promoting my post (also because I was a way ahead from others). But my exams are going to over on 22 June, maybe I will participate again. And thank you for the wishes. Congratulations bro for your win, I will also participate in next contest to try my luck. First of all Congratulations and second thing is that it looks like you are winning is a habit for you. Thank you for your wishes brother. I hope you are visiting my entry to support me. I would love to see your comments and shares. The next contest is running already. You can find my entry in the link below. It would be great if you can show your support. Congrats and when will the next contest starts!! BTW, did you see the giveaway on my blog?